This last week has definitely felt like April. All of these April showers are helping all my plants and flowers grow so I am not complaining. This week Cara and I chose Rain as our theme. So I grabbed my macro lens and headed outside in search of rain drops. You know I can't resist a good rain drop. I love that we both captured rain drops. I think they work well paired together. For more Team Up Thursday head on over to Mental Inventory. 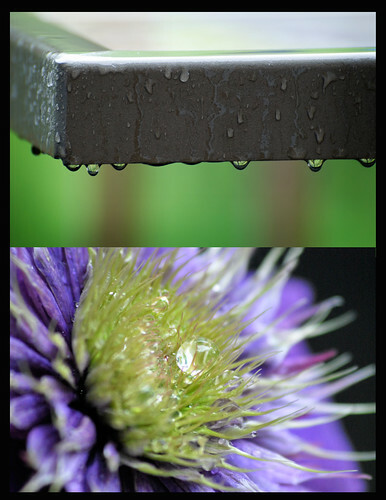 I love the way you placed them, it's like the bench rain water dripped down on the flower, very cool! And, you know I love me some macro too, beautiful shot!! I love rain drops! Both of these photos are fantastic, and the purple really pops against the green/grey. Nice! these photos are very relaxing to me. something about rain does that to me :) love the photos! You cant resist a good rain drop....but I know we both cant resist pulling out our macro lenses! I seem to be using mine all the time now that everything is coming into bloom. You captured the flower wonderfully! Great DOF. Oh so lovely! It looks as if the flower is holding onto that drop! Great macro. And great dip, team. okay, now those are just gorgeous. Raindrops are so soothing to the soul. P.S. I want a macro!!! This is just gorgeous! I love how the greens tie them together and the way you put the table above like it is dropping the rain onto the flower! I love me a good raindrop, too! That flower is fantastic Jen! And the perfect raindrop right in the middle! Oh, this is my fave this week! I was so glad rain/water was on the list you sent me. I love the way these came out. Your flower shot is spot on and I like the similar colors. Great color in both the shots - nice job on capturing the rain! How perfect for spring! I think you must have had a premonition about all the rain that was heading your way! Stay safe!